The number of people confirmed dead in wildfires sweeping northern California has climbed to 31, as officials warned that conditions would worsen. 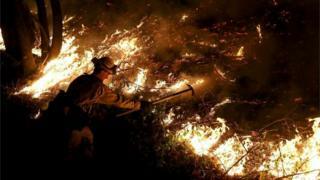 Hundreds of people remain missing as at least 22 fires rampaged across the state's famous wine country. More than 8,000 firefighters are now battling the flames. The wildfires have destroyed more than 3,500 buildings and homes over 190,000 acres (77,000 hectares) and displaced about 25,000 people. 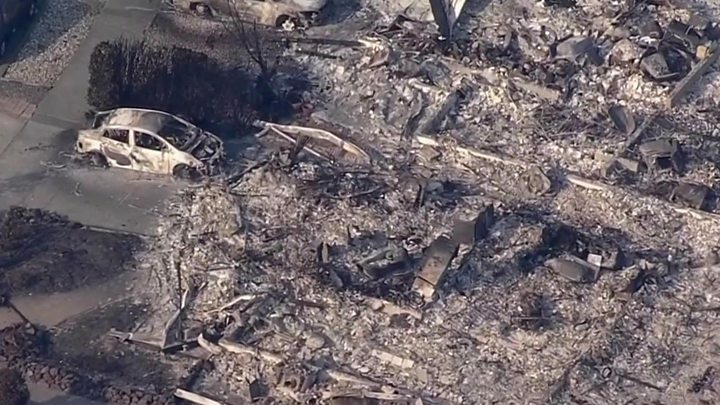 Seventeen people are now confirmed killed in Sonoma County, with another eight in Mendocino County, four in Yuba County and two in Napa County, officials said. The updated casualty figures mean the wildfires are the deadliest in California since 1933, when 29 people died in fires at Griffith Park in Los Angeles. Strong winds that have fanned the flames eased in recent days, but forecasters warned they were set to pick up again on Friday night. "We are not even close to being out of this emergency," Mark Ghilarducci, state director of emergency services, told reporters. State fire chief Ken Pimlott warned of "erratic, shifting winds all weekend". Sonoma County Sheriff Rob Giordano said recovery teams with cadaver dogs were searching the smouldering ruins of homes. "We have found bodies that were completely intact, and we have found bodies that were no more than ash and bone," he said. Ten victims, with an average age of 75 years old, have been identified so far, Sheriff Giordano said. Some of the elderly victims were identified by "a piece of metal left from somebody's surgery, like a hip replacement, with an ID number that helped us identify the person", he added. It is not yet clear what started the fires on Sunday night, but officials say power lines blown over by strong winds could be the cause. 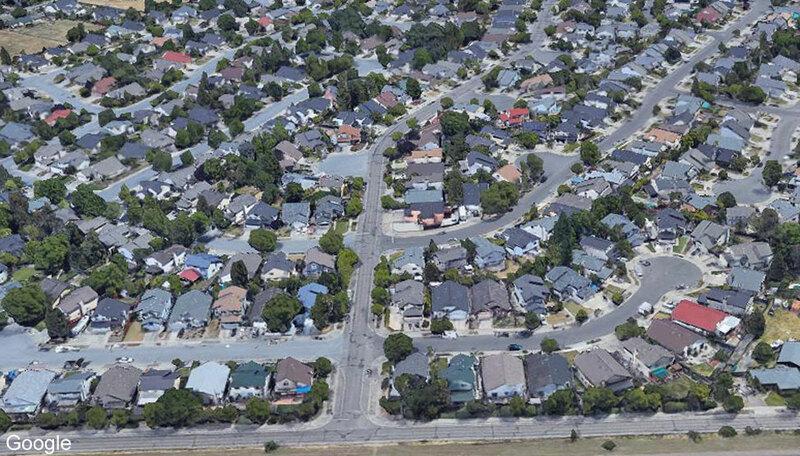 One of the greatest threats to life is believed to be around the town of Calistoga, Napa County, where the entire population of 5,000 has been ordered to evacuate. Calistoga Mayor Chris Canning warned residents to stay away since rescuers would not be able guarantee their safety. "You are on your own," said Mayor Canning. 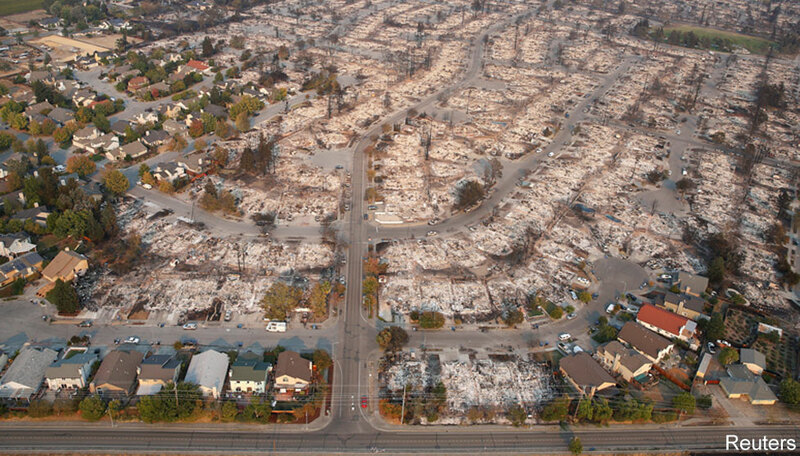 Geyserville, a town of around 800 people, and the community of Boyes Hot Springs, both in Sonoma, were also evacuated. The huge fires have sent smoke and ash over San Francisco, about 50 miles away, and over some towns and cities even further south. At least 13 Napa Valley wineries have been destroyed, a vintners' trade group says. Cannabis plantations in fire-scorched Mendocino County could lose millions as many are uninsured, according to Nikki Lastreto of the local industry association. Marijuana farmers cannot insure their businesses since federal law bans the drug. Though recreational cannabis was legalised in the state in 2016, California's retail market does not open until next January.